Corneal Collagen Cross-linking (CXL) is now FDA-approved! The Corneal Collagen Cross-linking (CXL or KXL) procedure was approved by the United States Food & Drug Administration (FDA) in April 2016. This procedure attempts to prevent disease progression and reduce corneal curvature (steepness) in patients with certain forms of keratoconus and post-refractive surgery corneal thinning (ectasia). The cornea is the clear, outer layer of your eye. The middle or stromal layer is the thickest part of the cornea. It has mostly water and a protein called collagen, which is similar to the collagen in your skin but specialized for the eye. Collagen in the cornea is strong and flexible. It also helps the cornea keep its round, regular shape. This healthy cornea focuses light so you can see clearly. CXL is an eye treatment that may be done in the office. 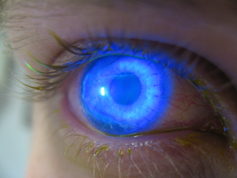 The actual treatment involves the instillation of anesthetic eye drops to aid in the removal of the corneal surface layer; instillation of vitamin B2 (riboflavin) eye drops over twenty minutes; followed by treatment of the cornea with ultraviolet light. The full treatment takes about 1 hour. A bandage contact lens and various eye drops are used afterwards for comfort and to facilitate healing of the surface. The vitamin eye drops and UV light work together to make the collagen stronger. The cornea becomes stiffer and usually stops bulging. 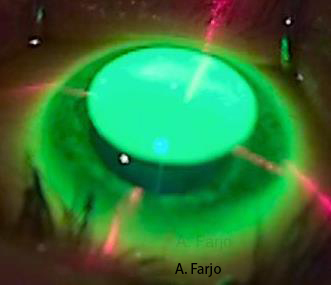 Corneal surgeons have extensive experience with corneal collagen cross-linking for keratoconus and post-refractive surgical ectasia in Europe and worldwide. Dr. Ayad Farjo has also participated in clinical trials of the procedure in the United States. Given the recent approval from the FDA, we anticipate restarting treatments (we had previously been part of an FDA-approved study protocol) according to the approved protocol in October 2016 We are currently working with medical insurance companies attempting to expedite this procedure as a covered benefit. As with all surgical procedures, there are risks involved and not everyone benefits from the procedure. If CXL is among the treatment options suitable for your problem, we will provide you with more specific information about it during your appointment with Dr. Ayad Farjo. Melanie Bachelor and Alyssa Widner are available to help coordinate treatment scheduling.